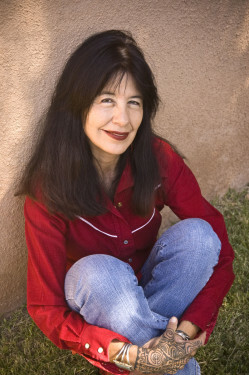 Joy Harjo, of the Mvskoke Nation, was born in Tulsa, Oklahoma. Harjo has published eight books of poetry. Her most recent collection of poetry Conflict Resolution for Holy Beings made the short list for the Griffin International Prize and was named the American Library Association’s Notable Book of the Year. Her awards include the prestigious Ruth Lily Prize from the Poetry Foundation for lifetime achievement; the Wallace Stevens Award from the Academy of American Poets, a Guggenheim Fellowship; and the New Mexico Governor’s Award for Excellence in the Arts, among others. Her memoir Crazy Brave, won several awards, including the PEN USA Literary Award for Creative Non-Fiction. She has been performing music with her poetry since the early 1990’s and is the recipient of a Native American Music Award (NAMMY) for Best Female Artist of the Year. Harjo is at work on a musical, We Were There When Jazz Was Invented, a show that will rewrite the origin story of blues and jazz to include the musical contributions of southeastern native peoples. She is a board member of the Native Arts and Cultures Foundation and is a founder of the “For Girls Becoming” arts mentorship program for young women of her tribal nation. Technique and craft are elements necessary for construction of fine poems, but music and soul are also crucial to the realization of poetry. I see this residency and workshop as a place to explore the how and why of poetry, to move beyond the most obvious toward a mysterious and meaningful sense of craft through discussion and writing. And maybe while we’re at it we’ll try song making directly or try performing with music.